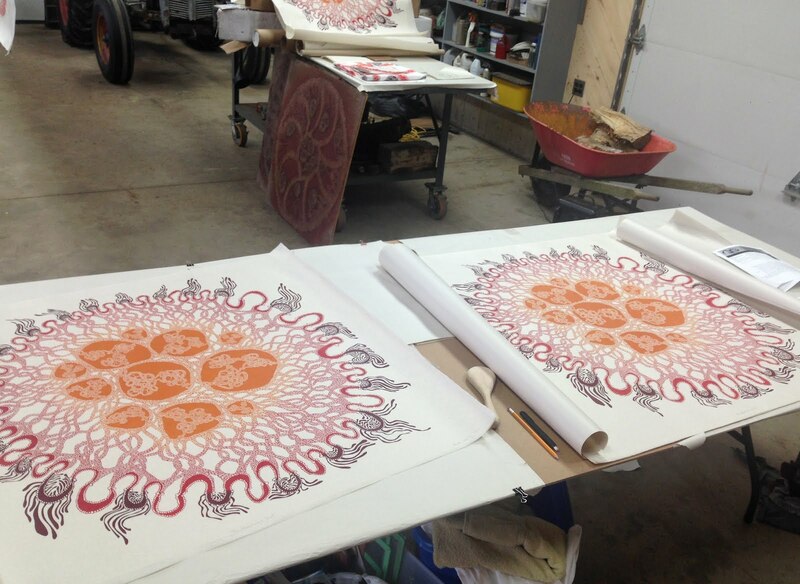 On Friday January 27th, I got up early, packed the car and headed back to Wolfville, NS for another Printmaking marathon weekend at Shipston Designs Studios. The wonderful Julie and her welcoming husband Peter hosted me on their beautiful property. My experience there is always a mix of being in this beautiful retreat in the country and very hard work with no distractions. Peter relinquished his huge "garage" space for me again so that I could take on part 2 of this project, this time editioning "The Old Soul" linocut on Shoji Baika Natural. As smoothly as the last mini residency went, this time I ran into all the problems at once. My favourite barren got damaged and was damaging my paper before I noticed it. My inking roller started falling apart leaving little pieces of roller in the ink, my paper did a weird unexpected buckling thing. This of course is part of printmaking, printmakers are after all master problem solvers. 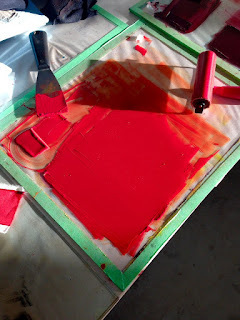 Things sometimes go wrong but when you deal with hand printing blocks that are 3x3ft the consequences are felt literally in the arm, hand, wrist. I ended up having to print two additional prints more than planned and by the end of it even with icing my arm regularly and many breaks in between it was still too much. I did get it done and I have to thank Julie for being a master motivator when I was feeling down and in pain. Now I do have 2 more blocks to edition before October but I can take my time and prepare more. To make those happen I have to order that detail roller set that's been on my list for a year. Having a 1/4 inch roller will make all the difference when spot inking tiny detail! Beautiful sunrise on my way out of the house. After my arrival I set up the studio and cut more paper, just in case. It turned out it was a good move. Matching colour with old swatches on a proof printed on white fabric. Mixing inks and pulling the first proof to make sure the colours are where I want them to be, I actually ended up deciding the next morning to alter the red again. Crunchy walk to the studio. I started the day by changing the red to a slightly warmer colour. 3-step inking process. Inking the block each time took about 1 hour. Step two, with a smaller roller the intricate spots with brown ink. This one would have been much easier with a 1/4 inch roller instead of a 1 inch roller. Step 3, the circular spots get inked overtop it all with a dark purple. Then I place the paper, secure it and roll it onto the block. I then transfer the ink to the paper by rubbing the back of the paper with a barren. The paper is so delicate and transparent that I can see exactly what I am doing, the ink shows right through on the other side. Finished and ready to be pulled of the block. The first big reveal of the weekend. Snow flakes dancing in the field. After a nice flurry of snow it froze and crunched beautifully on the path between house and studio. A path well-trodden this weekend. It took me an entire day to create two additional prints due to the pain in my arm. But I got it done. What a challenging printing session. Thank you to Julie for keeping my energies up, to Peter for stopping in for a chat when I needed it most, to Scott for hanging out on the phone with me and distract me when I almost gave up. Last pull for this residency. As a deadline was looming I needed "The Adventurous Soul" prints signed and ready to go. I took advantage of the large table space to get it done on Monday morning. Then it was time to pack everything up and load the car. But before I could leave I had to give the cuddly Mr. Thomas McNally a good massage. He is the cuddliest kitty I have ever met. Erma Turnip was not impressed when I returned home and smelled like Mr. Thomas McNally.